Two thousand and ten has yet to end but I’m already planning for our 15th wedding anniversary next year. I started to look around for anniversary gifts for my husband recently and I’m choosing the items based on wedding anniversary gifts by year. 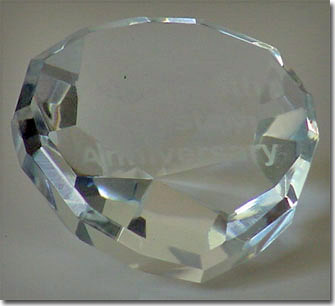 Since crystal is the primary material for 15th anniversary I might give him this paper weight crystal desk diamond or a glass mug with print of his favorite personality or sports team. If I have enough savings to buy a luxurious gift item, I will surprise hubby with a sports watch with his name etched on it and our anniversary date. He will surely like it as he loves to collect watches. This entry was posted in Uncategorized and tagged anniversary gift, anniversary gift ideas, anniversary gifts by year on December 11, 2010 by Yami.